This is a 2007 2-on-1 compact disc reissue of the 1956 Westminster Soundproof and Soundblast albums. In the mid-to-late Fifties, talk of satellites, sputniks and the space-race was increasingly capturing the public’s imagination, and musicians were no exception. From the free-jazz excursions of Sun Ra to the early electronic experiments of Joe Meek, Raymond Scott and Louis and Bebe Barron (composers of the first ever all-electronic soundtrack for the film Forbidden Planet), the idea of interstellar travel inspired some of the most innovative records of the decade. Yet few were more remarkable, or indeed improbable, than the albums for prepared piano released by two Juilliard School graduates turned mavens of easy listening called Arthur Ferrante and Louis Teicher. The composer John Cage is generally regarded as being the originator of the prepared piano, in which various items – rubber stops, paper wads, chains – are placed on or between the strings of the instrument with the aim of radically transforming its sound, as early as 1938. The player could also pluck or hammer he strings directly. Whereas Cage mostly used the technique in the service of music that challenged all the conventions of classical music in a way that would have alienated all but the hardiest listener, Ferrante and Teicher did so with an entirely different aim in mind; they wanted to explore new sounds without radically departing from the piano duo format or traditional harmonies. Westminster were also clearly eyeing the nascent hi-fi market, warning potential purchasers: “If you do not have the finest high quality audio equipment, don’t bother to play this record.” Given that hi-fi was still considered something of a specialist area in the mid Fifties, some might say that was a high-risk strategy. Yet such attention to sonic detail, and to creating a soundworld rather than attempting to simulate a concert hall, was rare indeed. The use of the studio as an instrument in its own right was still very much in its infancy. Sure enough, though much of the music chosen by Ferrante and Teicher was familiar, the sounds produced by the duo’s heavily modified pianos in this pre-synthesizer age were not. An uninformed listener would swear he was hearing an ensemble of marimbas, celeste, xylophones, castanets, harpsichord, autoharp, woodblocks and other percussion instruments. In fact before they could release their first single using prepared pianos, the pair had to issue an affidavit to their own label to the effect that no other instruments were used in the recording. Even today, it is easy to see the label’s point – it’s still hard to believe that such a range of sounds was produced over 50 years ago without recourse to some kind of digital deception, or by sneaking in the odd ringer. But as well as the modified pianos, the record also employed one or two ingenious technical innovations. As their personal manager Scott W. Smith recalled: “This LP included their first use of echo… sending the sound by wire to the floor below’s tile bathroom… to speakers inside. Then mics were placed outside the bathroom door… looped to a delay and sent back upstairs to the mix room! Echo chambers were not yet invented!” There are also early sightings – on Cumana and Lover – of the reversed piano without which no psychedelic album of 1967/8 was complete. Of the two albums, Soundproof is arguably more experimental musically, if not technically. Man From Mars boasts an echoed riff that anticipates the electronic sequencers that features in so much Seventies Krautrock, Baia suggests a kinship with the exotica of Les Baxter and Mermaid Waltz is nothing less than underwater Satie. 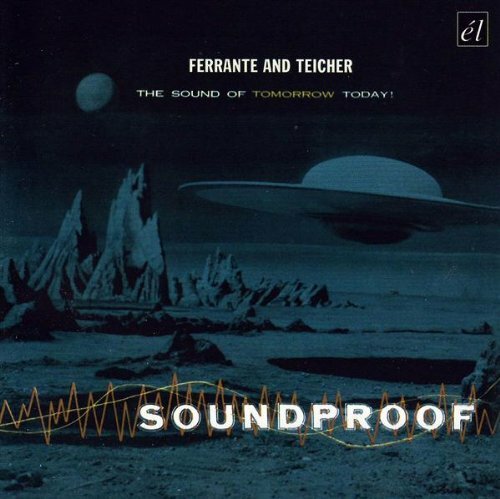 Though the sleeve notes of Soundblast also pushed the hi-tech angle (“Ferrante and Teicher make their pianos bring the World of Space to you, even if they cannot carry you off bodily to the World of Space”), the pair this time unaccountably decided to focus on “a group of Latin American favourites,” as though interstellar travel and the Mexican Hat Dance were obvious bedfellows. Ferrante and Teicher moved on to establish themselves as a hugely successful piano duo, carving themselves a big slice of the Liberace market. Their sales soared, but they never again produced anything quite so memorable. And they certainly had no further truck with the World of Space.